Two new names for me here, though when I first saw this on the new releases list, I assumed the Goldmark was Karl Goldmark, whose name I did know and whose trios I was familiar with. But no, the Goldmark was Rubin, Karl’s nephew. Quite how the two found themselves on the same CD is not obvious, as there seems to be no connection between the two. Rubin Goldmark was American, born and educated in New York, a student of Dvořák during his time in the US. He was a distinguished teacher, his pupils including Gershwin and Copland, and he was Head of Composition at the Juilliard School. The booklet notes suggest that he taught those two notables there, but that is not correct – they were private students. His music was played regularly during his life, but as far as I can tell, there is only one other of his works currently available, a miniature for violin and piano on Solo Musica. The trio, his first published work, as with Beethoven, is a delightful find. There are strong reminders of his lessons with Dvořák, but not in an imitative sense. There is that melancholy underlying the fine melodies and interesting rhythms. Certainly, they lack a spark of genius, but then so do Dvořák’s first and second efforts in the genre. The Finale is a belter: full of vibrant rhythms, and a good tune. Felix Woyrsch was born in Silesia, now part of the Czech Republic, but grew up in Dresden and Hamburg. It was in the city of Altona, now part of Hamburg, where he became an important member of the musical community, having largely taught himself. He concentrated more on orchestral and choral music, and CPO has released two recordings of his symphonies (review). 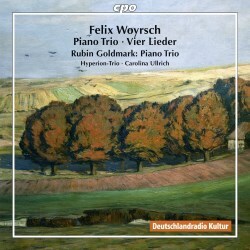 I first listened to this disc while suffering from a heavy cold, and thought my initial lack of enthusiasm for the Woyrsch trio might be due to that. I therefore put this aside for a couple of weeks. Having returned to it in good health, I found myself slightly less unimpressed, but still finding it much harder going than the Goldmark. Its point of reference is not surprisingly fellow Hamburg resident Brahms, who was an acquaintance of Woyrsch. There are some undoubtedly good ideas, most notably in the inner two movements, but they don’t really go anywhere. After listening to what I thought was most of each movement, I would find that I was barely a third of the way through. This occurred again and again, and perhaps best summarises my feeling about the work. I’m not really the person to make useful comments about the four songs, as lieder is not a genre that greatly appeals to me. These four songs, all gentle and heartfelt, are scored for soprano and piano, joined by an obbligato instrument; the cello and violin share the duties here. Despite my reservations, I did quite enjoy these, more so than the trio, to my surprise. The Hyperion-Trio have a number of recordings for CPO under their belt: Paul Graener (review), Joseph Marx (review) and Atli Heimir Sveinsson. In each case, the reviewer has commented favourably on their performance of little known music, and I can add my plaudits to that list. They treat these works with great care and warmth. For the songs to have impressed me must be due in great part to soprano Carolina Ullrich. Sound quality is good; the booklet notes adequate.